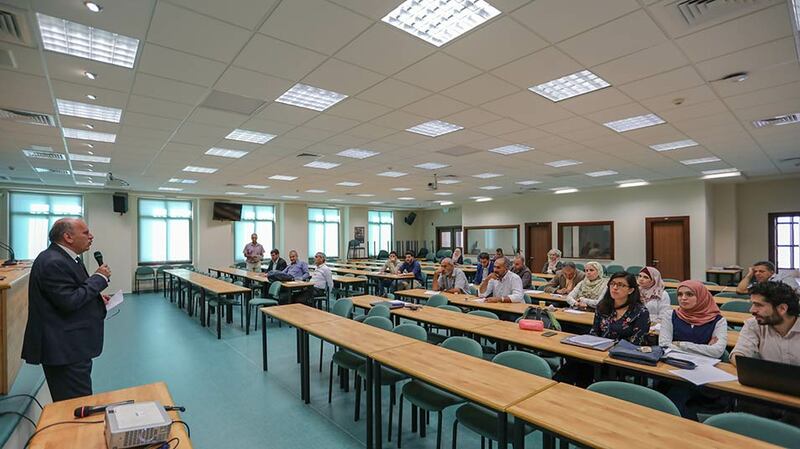 Palestinians and international wastewater management experts, professors, policy makers, and managers convened at Birzeit University on October 15-16, 2018, to explore industrial wastewater management in Palestine in a two-day workshop entitled “Promoting Applied Integrated Practices and Technologies for Sustainable Industrial Wastewater Management in Palestine,” an activity within a joint research project at BZU. 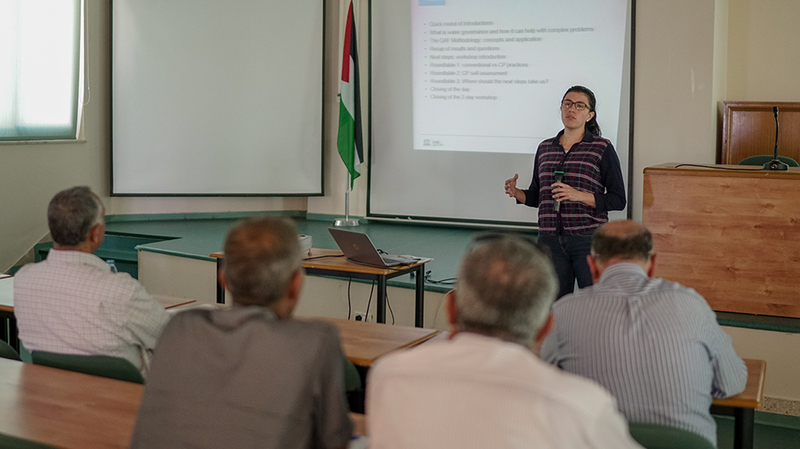 The workshop, organized by the Institute of Environmental and Water Studies (IEWS) at Birzeit University, together with the UNESCO-IHE Delft Institute for Water Education, featured the IEWS findings from research efforts within the second Palestinian-Dutch Academic Cooperation Program (PADUCO2) on Water. Rashed Al-Sa’ed, IEWS director, said the workshop was based on desk studies and applied research conducted in close cooperation with governmental agencies and municipalities, as well as undergraduate and postgraduate students at BZU, with the aim of promoting sustainable wastewater management practices and governance in Palestine. 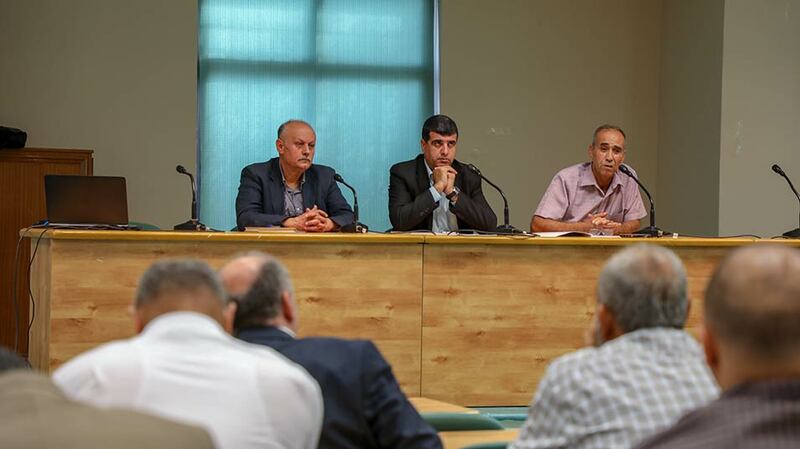 Director General Subhi Samhan representing the Palestinian Water Authority (PWA), mentioned that Palestinians are supplied annually with about 300 million cubic meters of water. The greater part of that water, however, is not reused or recycled, he stated. The method by which Palestinians can push for better wastewater management, Samhan told the attendees, was by promoting good governance and management measures, such as enforcing the “polluters must pay” rule, and incorporating technologies that are suitable for the Palestinian context and needs. Ayman Abu Thaher, deputy director general for environmental awareness and education at the Environment Quality Authority (EQA), reviewed the legal rules and regulations through which environmental protection efforts are carried out in Palestine, and the role of the various agencies in supporting and facilitating those efforts. “The Palestinian Basic Law provided the basic framework for environmental protection in Palestine, while law No. 7 of 1999 built upon that framework and regulated the environmental sector, supported by the inter-sectoral Palestinian Environment Strategy,” Abu Thaher clarified. He also said that there were two types of industries that affect how wastewater management can be carried out: modern industrial complexes, such as the Jericho Agro-Industrial Park, which have implemented wastewater management systems that are compliant with standards, and long-established assemblies of crafts, such as craft areas in Hebron, which have less than adequate waste management procedures. Mohammad Al Hmaidi, chief executive of the Water Sector Regulatory Council (WSRC), gave a brief overview of the council’s activities to preserve water resources and regulate wastewater management. The council’s role, he said, includes approval of water prices, issuing licenses for wastewater service providers, and supervising and monitoring compliance with local standards. Among its other services, the council also provides researchers and experts with an information system and database on water in Palestine with 233 variables and more than 20 key performance indicators. Additionally, it offers wastewater service providers with technical reports and performance indicators for their wastewater facilities. The first day of the workshop included several presentations by master’s students and researchers at the Institute of Environmental and Water Studies, and industry experts and wastewater treatment chief operators. Ibrahim Seiba, head of the sanitary section at the Jericho municipality, an alumnus of the IEWS, discussed the impact of discharges from the Jericho industrial zone on the performance of Jericho central sewage works. Along similar lines, Nidal Mahmoud, a researcher within the IEWS, presented a brief analysis of the industrial cadaster in the Wadi Zaimer catchment area, an activity within the INWA project at IEWS. May Atmawi, Saja Younis, and Ammar Diab, three master’s students at IEWS, gave presentations on a variety of research topics related to industrial wastewater management. Atmawi’ s presentation focused on enhancing the governance of industrial wastewater management in two Palestinian dairies by utilizing cleaner production and water footprint software, while Younis presented her assessment of the pretreatment of mixed agro-food industrial wastewater and an evaluation of the impacts on a pilot membrane bioreactor at BZU campus. Finally, Diab`s talk revolved around monitoring and evaluating an integrated up-flow anaerobic sludge blanket (UASB) reactor followed by nature-based treatment systems for slaughterhouse wastewater treatment. The second day of the workshop, facilitated by Andrés Cabrera and Ángela Bayona - task leaders, instructors, and researchers at the IHE Delft Institute for Water Education - included presentations on the significance of wastewater treatment and governance in Palestine and the primary findings and objectives of the workshop. In addition to the presentations, the second day also comprised roundtable discussions on conventional and clean production, clean production self-assessment, cleaner technologies from the PADUCO2 Program on Water. - Industrial wastewater management in Palestine is unsustainable with regional environmental, economic and political implications; a policy brief on good governance of Palestinian industrial wastewater management is key societal output of this project. - Cleaner production is at its infancy in Palestinian industrial sector, vocational training, visit exposures for technicians and management staff within selective industrial enterprises can help adopt and understand the benefits of application for cleaner production practices.